How to do a hotel mattress run! This is one of a few ‘introductory’ articles we have been running during August on areas which we often mention in articles but never properly explain! I thought I would take a look at the concept of ‘mattress runs’ today. A ‘mattress run’ involves booking a hotel room without the intention of spending the night, purely for the purpose of triggering a promotional bonus. Why would you do a mattress run? Hotel company promotions often incentivise you to make stays which are unnecessary. If you take IHG’s Accelerate as the best example (the last version is described here) it is perfectly possible that you might – with the right personal targets – be able to earn 40,000 points from just 2 x one-night stays. 40,000 points, even at my conservative 0.4p valuation, would be worth £160. If you have a Holiday Inn Express near you which sells for £39 on quiet Friday or Sunday nights, you could make a ‘profit’ of £80 by making two bookings even if you don’t need a hotel. Similarly, the current Hilton ‘status match’ promotion will give you Gold status until March 2020 for just four stays within 90 days. Diamond requires just eight stays in 90 days. If you can get close to this target, it might be worth doing a couple of mattress run nights to make up the difference. I did. Do you physically have to check in at the hotel? YES. It is very clear in the rules of all hotel loyalty schemes that you must turn up and check-in for your stay to be treated as ‘qualifying’. Some people fail to see the logic here. If this rule was not in place, however, it would simply lead to super-cheap hotels in Asia being block booked by people who never arrived. As hotels generally rely on additional spending in the bars and restaurants to make money, even the hotel owners who got the bookings would not be happy. What about chains like Hilton and Marriott which offer online check-in? It doesn’t matter. In most cases you still need to pick up a key at reception to be considered as checked in. There is an outside chance that mobile check-in may work. I had a non-refundable Marriott booking earlier this year which I couldn’t make, but checked in via the app and got the stay credit for it. Don’t rely on this though – you certainly can’t complain if the points don’t arrive. How do you deal with check out? I just leave the key on the bed or desk and leave. This is surprisingly common behaviour even among guests who do stay the night. I have never had a problem with this. Do you mess up the bed? This is a controversial one! Yes, I admit that I do like to pretend that I stayed the night by messing up the bedding and sometimes even running the shower and wetting a towel. Would the hotel care otherwise? Probably not, but I don’t want to find that the police have been notified because the hotel thinks something bad may have happened to me the night before! It is never an issue. You can usually get a copy of your bill online if necessary. By definition, you are likely to be doing mattress runs at very cheap hotels – the sort which are prepaid anyway. There is unlikely to be a mini bar so you are unlikely to face mistaken mini bar charges. In theory, yes. But this can go wrong, as I found out a couple of years ago. I have, many times, booked a room in the name of someone else for a mattress run. Many hotel booking systems let you add multiple names to a booking so you can add yourself as ‘second guest’ and put in the notes that you will check in first. Once, however, I booked a room for a friend at a Holiday Inn Express hotel. I had a friend who needed a room in a cheap regional city. I needed an extra night to hit my IHG Accelerate target. I offered to pay for a room for him, because it was cheaper than any London hotel I could visit for a mattress run and I saved a few hours of my time. I booked and prepaid the room, and he and his wife made the stay. I honestly can’t remember if I added him or his wife name as the 2nd guest or not. However, IHG refused to give me points for the stay on the grounds that I did not stay there myself. The bill for the room had my name on it. However, the credit card handed over at check in for incidentals which were never used was obviously not mine. If his wife had handed over her card it would presumably have been OK. However, as it was clear that the male guest was not me from his credit card, IHG’s system seems to have automatically flagged up that I was not there. This was the first time that this ever happened to me. There is another issue with this approach. A couple of years ago I did a mattress run on my wife’s IHG account at a Holiday Inn Express in Spain. I was named on the reservations as 2nd guest. However, it seems – under Spanish law, or at least the law in some cities – that the first named guest MUST turn up for the reservation to be valid. Even though I was named as 2nd guest and the notes to the booking said that I would arrive first, I had major issues. Luckily I had a credit card in her name on me. The hotel agreed to swipe this for incidentals which would make it appear as if she had checked in. I could easily have come unstuck with that one. In general, a mattress run should be relatively straightforward and I even find them fun. 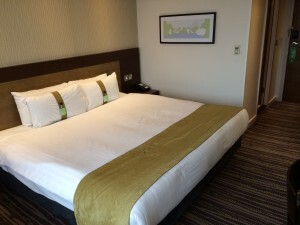 You can get to see, as I did two years ago, exciting places like the Holiday Inn Brent Cross! Don’t think that they are always trouble free, however, because they are not. I have booked my Mum and her partner for the Conrad Chicago and Conrad New York next month under my name (I am a Platinum, as she and her partner are only gold). I have added her as the second guest under the booking. My Mum has my Amex Platinum in my name for checking in, and her partner will not be present during the checking in process. Do you guys see this as being risky? Or should I just rebook under her Gold status? You should be fine. If she wants to use a different card at checkout just get her to present it before checking out. I always reserve with my Amex for any holds and check out with my Clarity card. Although you might have an offer on your Amex for Hilton, so check. For family I normally give them one of my credit cards to use for the check in. If your mum’s partner handed that over then the IT system will only see you. For me the most worrying element of mattress runs with others checking in is the countries where they photocopy/scan passports. They did this in Spain, but it actually still credited (Hilton). They may have problems. Once I booked a room in a Hilton Garden Inn Times Sq, and the second Person on the booking (my partner) could not check in until I arrived at the hotel, about 5h later. My wife and I always get good upgrades and gifts at the Conrad in Dublin and we’re only Gold. In my experience things are very smooth if it’s a family member with the same surname and they were already added to the booking. Once did a 10 night mattress run at a Hilton. Didn’t visit the hotel once. Got a Facebook friend to check in, mess the bed up and leave. I did however communicate with the hotel saying that I wanted to keep the room open incase I needed to stay and wasn’t sure which night I would be there. They were not concerned at all. 10 nights! What were the costs vs benefits on that one? I needed to get to Diamond – so blew 40,000 points – the hotel was just 5,000 points then. It might have been more than 10 nights – but at least that. we have had the “steal the shower gel” phrase before. The shower gel is there to be used by the guest and I would expect (hope) that half used bottles are thrown away and not given to the next guest. So taking them home is not stealing them. If the item is cleaned between stays (eg the bathrobe) or used multiple times (remote control) then taking it is stealing it, but consumable items are there to be consumed by the guest. I’m actually quite addicted to “Stealing the Toiletries”. At the Sofitel Macau, I was successful in accumulating nearly 30 bottles of Hermes toiletries over a 3 night stay. My wife has suggested counselling for me. Lol. Usually its wives that do that! A generous tip to housekeeping when they’ve got their trolley out might help in some hotels too if you want to save some time. If I’m staying in a hotel regularly or for 3 days upwards I try to tip housekeeping on the first day not the last, even in person if I happen to be there when they are. My boyfriend feels that I have a bit of a problem with teefing the toiletries too – I have a big box full of teeny tiny bottles of Peter Thomas Roth, Le Labo, Agraria and Les Notes de Lanvin bottles. When I couldn’t close the box anymore, I gave away the ones I liked least to a local food bank. They did upgrade me to the executive suite on the top floor though which was nice for a points stay. From recent stays at Hilton I see – much to my horror – they are discontinuing the Peter Thomas Roth toiletries so will also be attempting to stockpile the last of these to keep me going. I really don’t like the Crabtree & Evelyn and still miss the old PTR shower gel that had the microbeads. You can buy PTR retail in the US, saw it in TJ Max recently. How about the Hilton members room key access number from the app. I suppose they would view the records to see if used? 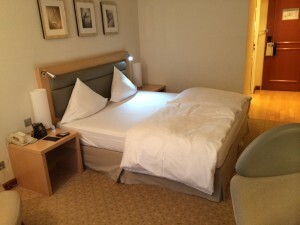 Currently on a diamond challenge with Hilton – 3 stays in and possibly 4 short – my local Hilton is £39 on a Sunday night is it worth it to do mattress run to get diamond even though I have no particular stays planned?! How much is Diamond vs Gold worth it to you until March 20? Ie. Are you planning on just staying in Hamptons / HGIs (maybe not worth it) or do you have a two week stay at a Conrad resort planned (prob worth it). Put some numbers to projected increased benefits (the delta only) and to help you decide. Depending how near it’s to your home you could always check in, have a couple of drinks on the voucher if it has no lounge (unlikely at that price) return next morning to have breakfast before going to work. That should more or less cover the £39 if there are 2 of you, without even considering future diamond benefits for any subsequent stays. I wouldn’t pay £39 for breakfast and drinks. For future benefits, yes, but If I pay for a hotel room I’m going to use it, that means taking as much electricity and water as I want! In the winter you could save £5 off your heating bill, of course offset by any cost of actually travelling there. Your heating bill are £5 a night??? My parents are on an Economy-11 Tariff, £5 a day is aspirational in the winter! What they really need is Economy-11 with Tesla batteries so they be flexible with the temperature, but still benefit from off-peak charging. Where is this Hilton? A great deal. As least I didn’t have to visit the hotel due to digital check in, 1PM was emailed invoice for the stay. What rate plan was that? I’ve made 3 bookings using the NHS discount code for late September…I hope those count!! Hilton Team Member Friends & Family rate plan. Might even stay there tomorrow as it’s cooled down – there are only a handful of air conditioned rooms, so it would have been miserable in the heat. Any news on the next Accelerator or another IHG promo for Sept onwards? Depending on the size of the bill, which for incidentals should not be too much, pay cash. Problem solved. Wondering if perhaps what was meant was when you had over your credit card at checkin to guarantee any incidentals ahead of when you might incur them, regardless of whether you actually will incur them or not? In the Hilton status match, does the free breakfast apply to your partner as well, or only the actual account holder? It’s member benefit, as long as you are gold with my way breakfast(default option, you need to change it to points) or diamond you get breakfast. As long as you reserve room for 2 it’s all fine (some properties have single rooms for just 1 person). Has anyone done a Mateess run on a MGM property in Vegas? We are booked into Vdara for 3 nights (comped) but also paid for one night at Excalibur as we’re doing a free Pearl Status upgrade if you stay one night. We will check in but won’t sleep the night. Just don’t want the hassle of having to then get there before 11am the following morning just to check out. I am pretty sure Excalibur has a quick online/ mobile check out that you can do – just leave the key in the room? A quick look now shows me that I can check out from here (UK) by just filling in an online form. Thanks so much this will save me an extra trip. I haven’t checked out of a major hotel in many years. I have never encountered a problem. Which major hotel have you been living at for many years? I’ve done a couple of mattress runs to the Holiday Inn Express in Stevenage which can be booked for less than £35 sometimes. There was a time when we lived next door to an HIX, very handy. Got to go back for the free breakfast. Why wouldn’t you sleep there for a change? OT: Are the Amex referral links working for anyone this morning? Every time I try, the T&Cs page is down, and when I try to use the link generated, the website doesn’t load. Never done a mattress run, but there are two occasions that I recall when I failed to turn up for a pre-paid booking, and on both times got the points. 1st at a Novotel in southern France, when I was in hospital instead. That one really surprised me, as it was a trade rate, which does not always get ponts, and was under €30. 2nd last March when our flight MAD-LHR was delayed, causing us to miss our onward connection at an airport Hilton. I walked from the terminal to the reception desk – it was still before check-out time – and talked to reception. They dais that I could still use the room for a shower if I really wanted, but assured me that I would get the points, and printed off my invoice to show the points award – well worth having as there was a 2500 point promotion at the time. Also, each year my partner and her siblings get invited to a private box at a well known racecource. They all stay at the HIE – my partner books two rooms and I book the third. So far I have got the points, even though I do not go. But I like the idea of the person checking in using a card in my name – surely that is what supplementary cards are for, yes? Similarly I have had IHG stays count as qualifying/points earning when I have missed checking in. Was a nice surprise each time to see the points post. I’ve always wondered what would happen should there be a need to evacuate the building during the night, such as a fire. I was staying at a Hilton in Chester last summer and about 2am the fire alarms triggered and the whole hotel evacuated. Fire brigade attended and determined it was safe to return, but whilst that was going on hotel staff were checking that every guest was present, using room lists. If anyone had been on a mattress run, where it seems you check in and then leave without notifying anyone, they would have been searching for those guests. At the time this happened I’d been thinking about doing a mattress run and this put me off (although it was great to see they checked every guest was present from their records). Really unsure, quite often when I stay at a hotel (especially weekends) I don’t get back in till early hours. Guess they expect everyone to get out of the floors not effected and they check the floor where the alarm has gone off. Checking anywhere where disabilities have been shared. Also: I’m sure that the number of hookers in any hotel at any given point in time more than equals the number of ‘mattress runners’. Especially during the night. Hahahaha this thread is killing me. The hookers vs mattress runners comment was just the icing on the cake. Since when, if a room is booked, do we need to be inside the room at some time or any time of the night? Then if the hotel want to charge for a no-show, or not to give points because I am not the guest who pays, this is another topic or the rule of the hotel. But freedom to move and go is part of our rights in a democracy without having to tell or inform other people whoever they are. Of course neoliberalism does not like that, but that’s real life to be where i want without telling someone else. In case of a fire, in the worst case, police is there to investigate if I was inside the room and I have been burned (some rest of my body may say it) or there was no one in the room and well that’s it for the result of the fire. It is easier to control the people, but is it the goal of our society? It’s still a democracy if people vote for policies that include nighttime curfews.